My name is Mrs. Weber. 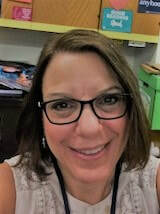 I am new to Wilson and serve as your Teacher Librarian. I am starting my 15th year in education and its my 12th year as a librarian. I enjoy reading, singing and playing flute, running/working out, and spending time with my husband and daughters. I believe that libraries create endless possibilities. Come see me in the library and I can help you find a book that is just right for you.